UPDATE: A Baltimore voter informs us that Early Voting was also conducted on touchscreen machines, meaning most of a "recount" would really only happen with the paper-based absentee and provisional ballots. Additionally, the absentee canvass begins today, and a new source informs us that Mr. Branch has lawyered up! Now, absentee vote totals are coming in. Is this race over? A Baltimore-based Democratic operative has contacted Maryland Juice with news of a potential recount in the City Council District 13 race. Our source is not an unbiased observer in the process and will hopefully provide updates as candidates start making decisions. Note: the Baltimore City Paper first made mention of this possibility, but we expand upon the news below. Last Tuesday's Democratic Primary Election canvass left the result of the District 13 race in question, since a razor-thin 15-vote margin separates the first and second place candidates. Incumbent Democratic Councilmember Warren Branch (brother to Delegate Talmadge Branch, a Baltimore City opponent of marriage equality) currently holds the narrow lead over newcomer Shannon Sneed. The totals currently include the Early Voting and Election Day polling location results, but it does not appear that provisional ballots and absentee ballots are included in the current count. There were a total of five candidates in the District 13 race, and notably, the bottom three candidates each earned significantly more votes than the slim margin separating Branch and Sneed. See the current vote tally below, courtesy of the BOE site (Unofficial 100% Verification of Election Results. 290 of 290 precincts reporting including Early Voting totals. Update time and date: 9/14/2011 3:18 pm). Warren Branch earns our endorsement for a second term. He has been diligent in trying to make sure the massive East Baltimore Development Initiative delivers on its promised benefits for the community, and his desire to provide the council with its own independent analysis of the mayor's spending proposals would provide crucial balance to a budget process that tilts heavily to the executive. Some partisans have complained to me, however, that they view the incumbent as part of a local political machine. This feeling may explain reactions to the Sun's endorsement, such as a recent letter titled, "How could The Sun endorse Warren Branch." The author is both "offended and flabbergasted." While the council's other incumbents largely sailed to easy victories, Warren Branch, who represents District 13, garnered just 15 votes more than challenger Shannon Sneed, a television news producer. With such a slim margin, Sneed said in an e-mail Wednesday that she was waiting on all the votes to be counted. "It is not over," she wrote. Should Ms. Sneed decide to request a recount, she must do so "within 3 days after the results of the election have been certified by the local board of canvassers," according to the State Board of Elections. One major factor in her decision will obviously be whether or not she has to pay for the recount. According to Maryland law, "the petitioner shall pay the cost of the recount requested. However, the petitioner is not liable for the costs if:"
The margin of difference in the contest is .1% or less of the total votes cast for that contest." Out of the 4,442 total votes cast in the race, the 15 votes currently represent 0.34% of the vote. Notably, State law requires the margin to be under .1% of the vote for a free recount. Right now that would mean the margin would have to be four (or fewer) votes. We will have to monitor the remaining votes coming in to see if the margin shrinks. Even still, this margin may be too thin for Ms. Sneed to pass up a recount -- even if she has to pay for it. All voters in Maryland use the same voting system. For polling place voting, voters use a touchscreen voting system.... With a touchscreen voting system, a voter touches the screen to make, change, and review selections and cast a ballot. For absentee voting and provisional voting, voters use a paper-based optical scan voting system.... With this system, a voter is issued a paper ballot and completes the oval next to the candidate or ballot question response for which the voter wants to vote. At the local board of elections, the ballot is fed into an optical scanner which reads and tabulates the selections made by the voter. As a result, my guess would be that a "recount" mostly means hitting a tallying button again, but perhaps a reader can enlighten us. Absentee, provisional and (I believe) early voting ballots, on the other hand, are paper ballots subject to a traditional recount. There, we might see the margins move. The only other place I can see votes shifting is if there are any challenges to voter eligibility/residency or proper authentication/execution of voting-related documents during the absentee canvass and provisional canvasses. But if I'm missing something, let me know. 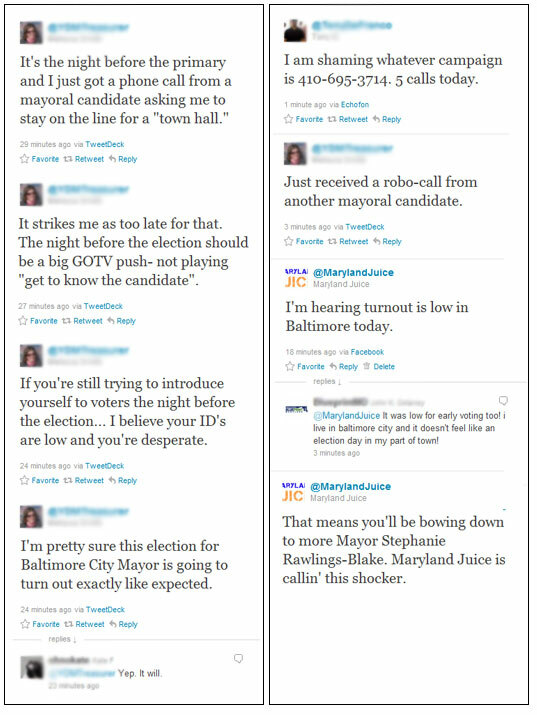 As for the top-of-the-ticket Mayor's race, a few people were annoyed to see that Maryland Juice didn't cover the Baltimore City races at all. We apologize but ask for patience as we develop a larger Baltimore-area contact network -- and let's be honest, even writing another "boy this race is boring" article would have been canned and cliche. 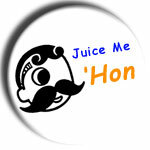 But don't forget, you can always leak your juice here, 'hon! Interested to see how long this goes on... I can't remember the last time a council race was this close. Also, not that it impacts the November outcome much, but the two Republican candidates for Mayor are separated by a similarly small margin- I think 22 votes?